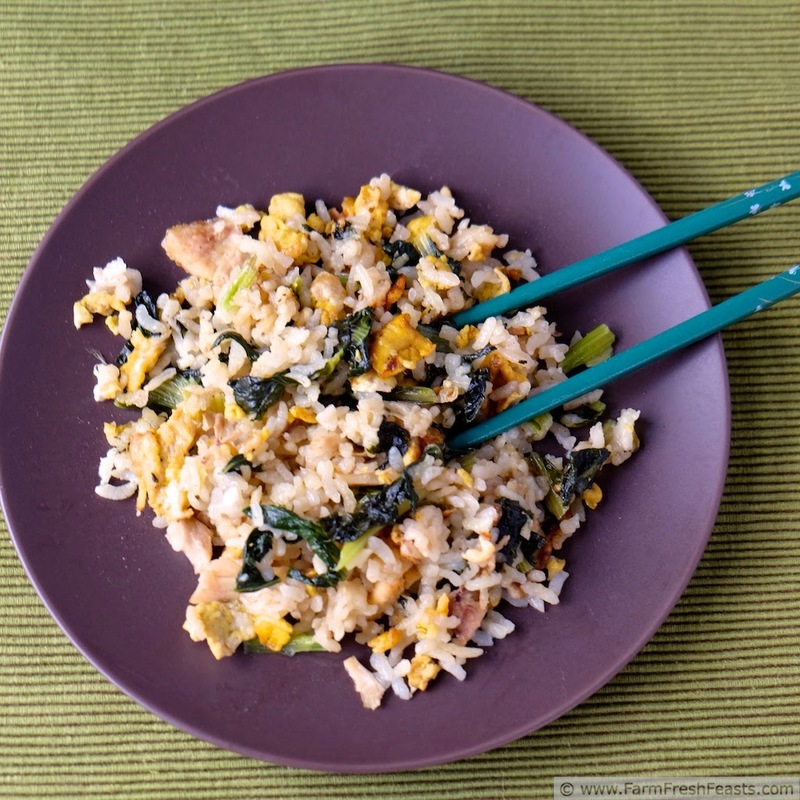 Farm share tatsoi quickly cooked with leftover turkey and egg in a fast & easy fried rice. 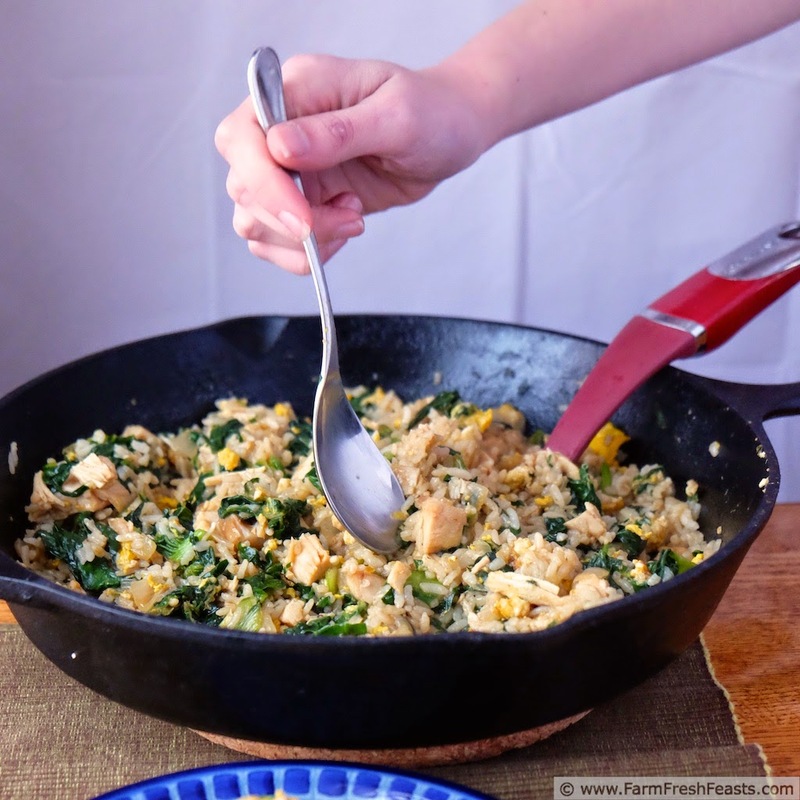 I followed Tip #1 of my Five Tips to Feed Your Family from the Farm Share and made something familiar--fried rice. Usually when I prep cabbage type vegetables for stir frying I'll chop the thicker stems to cook with the onions, and add the sliced leaves later in the process. Not so complicated with tatsoi. We've had tatsoi in the farm share box both as a bag of leaves and as an entire head. [The head is more photogenic.] Either way I just rinsed the individual leaves and tossed them into the skillet--no extra chopping necessary. I like to repurpose leftovers into a new meal, so I used a hunk of leftover turkey breast--though you could use chicken, ham, beef, pork, tofu or additional egg for protein. 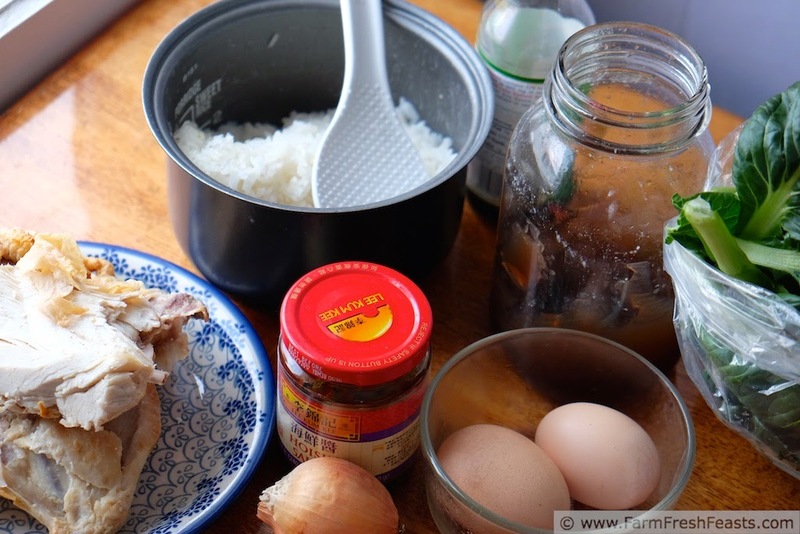 I'd be lying if I said the rice was leftover--I had my daughter start the rice cooker at lunchtime so I could come home and chill the cooked rice before I needed it at dinner--starting with cold cooked rice helps the grains to remain separate in a fried rice. Lately I've been lazy been simmering my stock for a long time, long like 8 hrs, so my turkey stock shown in the photo was at the Chicken Jelly stage. Instead of gathering garlic and ginger to season the fried rice, I used prepared hoisin sauce for an easy flavor. It's one of Lydia's ingredients for a Perfect Pantry. The first time I made this my daughter enjoyed the leftovers for lunch. When we got tatsoi again it was time to photograph the ingredients and write it up for the blog--yet my daughter enjoyed the leftovers for lunch again! She's stealing the food while I'm trying to photograph it! For other recipes using Tatsoi . . . well this is the first one for this blog. 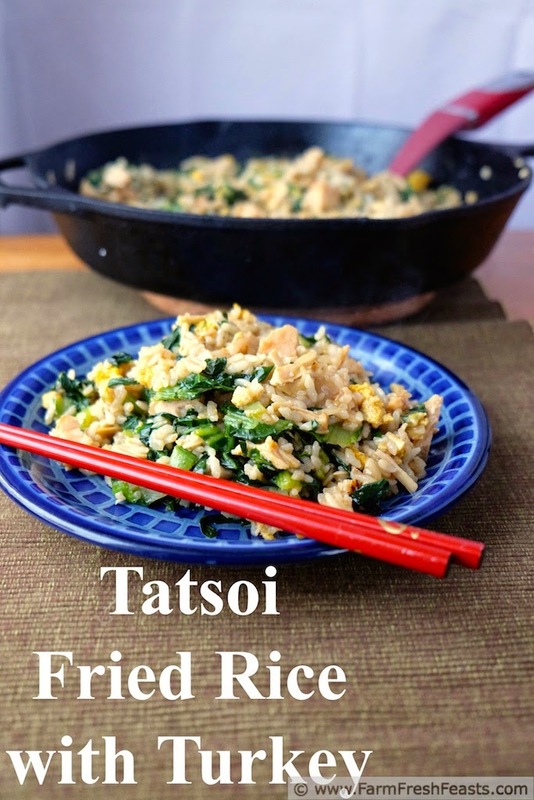 I suppose I should add a Tatsoi category to the Visual Recipe Index by Ingredient at some point, though all I've done with it so far is fried rice. Over and over. In the meantime, I'd recommend hitting the Bok Choy Recipes Collection or the Cabbage Recipes Collection. In a small bowl, combine turkey stock, hoisin sauce and soy sauce. Use 2 tablespoons of hoisin sauce if you're not sure about it, use 3 if you're a fan. Set aside. Preheat a large skillet over medium heat, and add a tablespoon of oil. Pour the beaten eggs into the center of the skillet and let them cook for a minute or two until the bottom is set. Lift up the egg from one side, allowing any liquid egg to be pushed off the side to cook, then work your way around the egg repeating this lift until all of the liquid has been pushed off the egg. Flip the egg over and briefly cook, about a minute, until set. Chop the egg into chunks and set aside. Add remaining oil to the skillet, turning up the heat to medium-high, and sauté the onion for 3 to 5 minutes until it starts to soften. 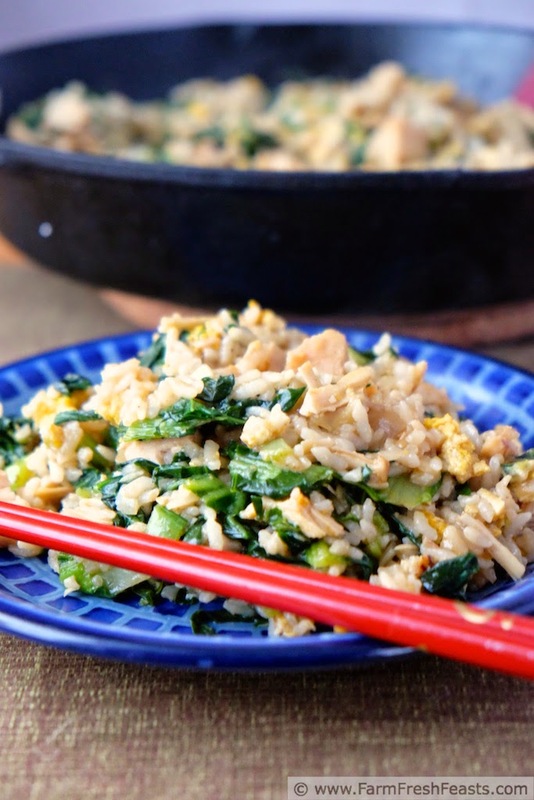 Add the tatsoi, turkey, and rice and toss together in the skillet until combined. Return chopped egg to pan, pour seasoned stock over everything, and stir until heated through and stock thickens to glaze the vegetables, about 3 to 5 minutes. Serve hot with extra soy sauce, or hoisin sauce if it floats your boat. Fried rice is the perfect meal to add leftovers to. This recipe looks and sounds delicious. 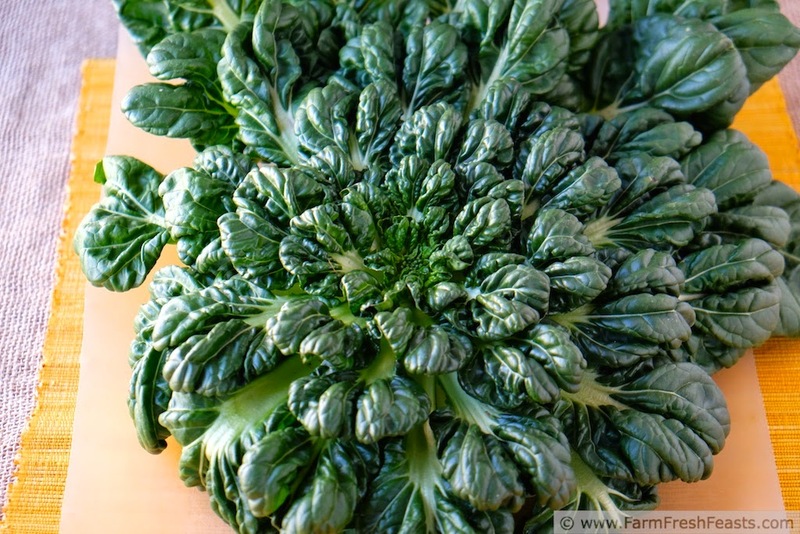 I've never tried tatsoi, I'll have to look for it. Fried rice, pizza, quiche, there are so many ways to use up leftover bits and bobs. Wow that tatsoi is sooooo pretty! Thank you--I was pretty pleased with how this photo turned out (though now I want to re-shoot with a different angle). Wow, never heard of it! Ten years in and I'm still getting surprised by vegetables. This fried rice looks delicious! I've never had tatsoi before - can't wait to try it! It's fun to find these new-to-me veggies. Heck if it works, then keep doing fried rice. I keep making your Breakfast Salad with my cabbage. Also this veggie, green, thingamabop is totally new to me. I'm intrigued. Anything the kids will eat I keep on doing. It seems to work for me. 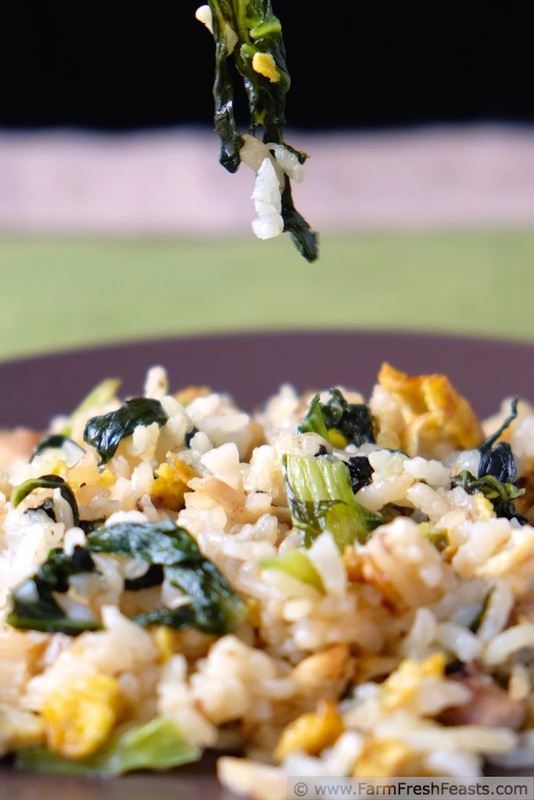 I love greens in friend rice--which is weird because in general I do not like cooked greens. Go figure. Also--my chicken stock cooks for like 24 hours! I love a good slow cooked green with plenty of pot liquor and cornbread to sop it up. I'm alone in that respect, in my household, so I save it for eating out at BBQ joints where I can choose greens as a side. 24 hour chicken stock--well done! Love tatsoi and bokchoy. Looks great! I'm so glad someone knows what this is. I have never had Tatsoi Fried Rice. This is going to be a fun recipe to make. I have only had the Chinese and Indian Versions of Fried Rice. Your recipe is perfect! Heck, I've never heard of half the stuff I make until I think up a name for what's sitting in front of me. A green I've never tried?! Thanks for introducing me to it! This fried rice looks great. Des, meet Tatsoi. Tatsoi, meet Des. I never know which party to introduce to whom. Hope I didn't offend. I found your post looking for a recipe to prepare Tatsoi growing in my garden. I was thinking of adding the mustard greens to something like a Chicken & Rice dish. You've grown tatsoi?! I bow, I am not worthy. Well done. Sounds like an excellent idea for a dish.